In this gorgeously-illustrated story, a young boy named Finn misses his grandfather. Living by the sea allows him to look out his window and dream of the place his grandfather told him about where the ocean meets the sky. This fantastical place has flying whales and jellyfish and floating castles. One day he builds a boat and then falls asleep inside. When he wakes up, he finds himself out at sea. He sees images in the clouds and knows that he is on his way to the place where the ocean meets the sky. With the help of the great golden fish he continues his journey. But will he find what he is looking for? And will he ever return home? As they did in The Night Gardener, the Fan brothers have created an exquisitely beautiful book about finding hope and love in the stories of those we love. The fantastical parts of the story are intriguing and are bound to catch the attention of young readers and listeners. 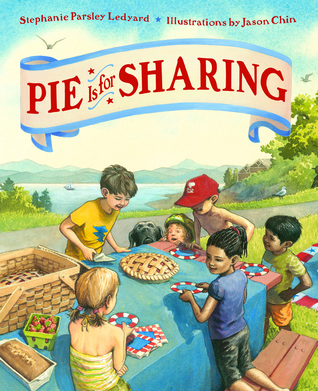 Pie Is for Sharing is a gorgeously illustrated ode to sharing by debut author Stephanie Ledyard and acclaimed artist Jason Chin. There are some illustrators that I know will create beautiful pictures every time. Jason Chin is one of those illustrators. In this book about the joys and challenges of sharing, he beautifully illustrates the generic words as a family vacationing at a lake with friends. This is one of those books where the illustrations take the words and make them so much more. As the author talks about sharing pie, sharing time, sharing a tree with a bird, and sharing a hug when one gets hurt, Chin takes the reader on a trip with a bunch of kids as they enjoy a day swimming and playing. The book is a beautiful tale of the joys of relationships and learning to share with each other, even when it's sometimes hard. In this tender story of a grandfather and his grandson, the reader discovers quickly that the two don't speak the same language, literally. This creates a frustrating wall between the two as they eat dinner and then watch TV together. Finally, the boy goes to the table and starts to draw with his markers. He draws himself as a superhero. To his surprise, his grandfather gathers his drawing materials and creates an image of himself as a warrior. Together they draw a story of the two of them fighting off the bad guys, until they find themselves relating in ways they never expected. There are words in the story, but they don't start until mid-way through the book when the boy and his grandfather start to communicate.. The symbolism of that is powerful. 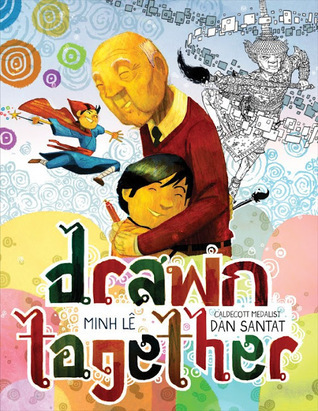 Santat's illustrations beautifully complement Le's words as he makes the drawings of the boy and the grandfather visually distinct which allows the reader to see how the two learn to communicate and relate to one another. A truly winning story about the creativity that is sometimes needed to help people overcome differences. Terrific reviews, thank you. 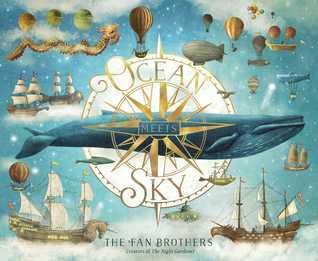 Ocean Meets Sky is a particularly beautiful cover! 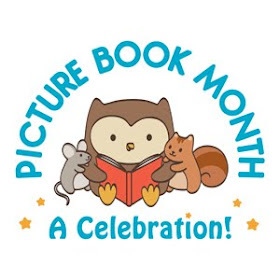 Congratulations to all authors and illustrators.